A Diamond Select Release! Where's the safest place on the Enterprise? Right behind Worf! He is the ultimate way to "Klingon" to your coins, Trekkers! 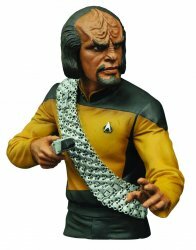 Make your money that safe by putting it inside this 7" vinyl bust bank depicting Star Trek's most famous Klingon crew member, with his phaser at the ready. With detailed, bust-quality paint applications and a coin slot on his back, this functional collectible is torn between two cultures - does he belong to both, or neither? You decide! Collectors Note: Comes packaged by the manufacturer in a clear polybag. Sculpted by Patrick Piggott. 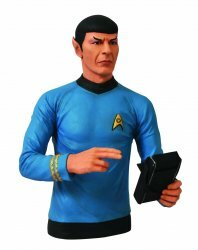 Also want the Mr. Spock Bust Bank? Click on the handy Buy Both button below!